Vital to business adaption, survival and success is understanding the social and technological trends that are driving change, and who is leading them. Meet Gen Z, the up-and-coming generation. Different from their millennial predecessors, Gen Zers are quickly becoming powerful influencers both as consumers and as employees. 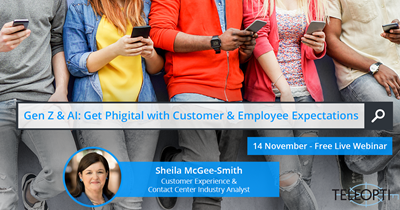 Join Customer Experience & Contact Center Industry Analyst, Sheila McGee-Smith, as she discusses who exactly Gen Z is and how to delight Gen Z as a customer and prepare for them as an engaged part of your workforce. This webinar explores what a ‘Do-It-Yourself’ attitude really means for customer and employee care, along with digging into FOMO, phigitalization, the gig economy and other new terms for business. Sheila unearths the emerging role of Artificial Intelligence in supporting customer and employee experiences, especially with a generation that sees AI as an attainable, assistive option, rather than something that replaces them. Learn how taking platforms and solutions to the cloud can help companies and their evolving workforce succeed, at a faster rate.